Greater aircraft range and capacity through technological developments allow airlines the flexibility to explore new business opportunities whilst maintaining focus on cost reduction. Looking at the four segmentations more closely, in the Small segment typically covering the space where most of today’s single-aisle aircraft compete, there is a forecast future requirement for 28,550 new aircraft, representing more than three-quarters of total expected demand. 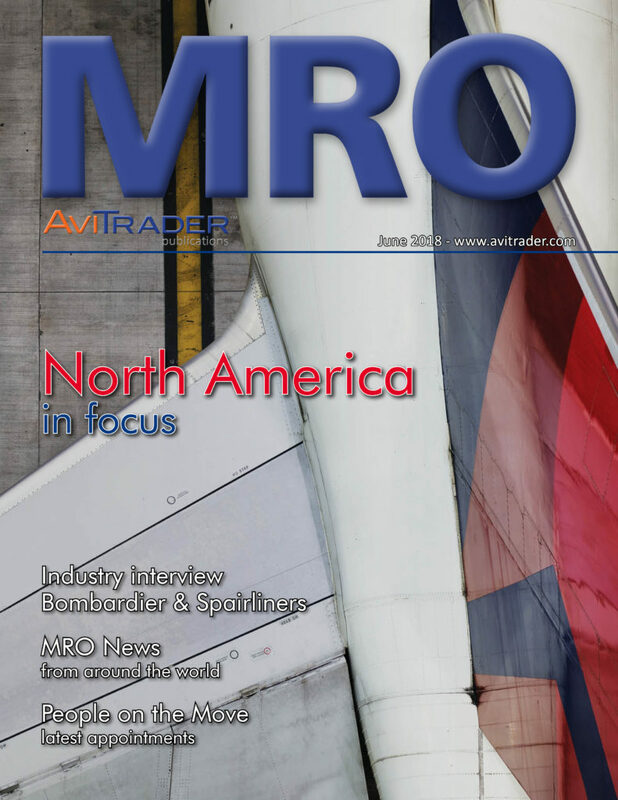 In the Medium segment, for missions requiring additional capacity and range flexibility, represented by smaller widebodies and longer-range single-aisle aircraft, Airbus forecasts demand for 5,480 passenger and freight aircraft. For additional capacity and range flexibility, in the Large segment where most A350s are present today, there is a need for 1,760 aircraft. In the Extra-Large segment, typically reflecting high capacity and long range missions by the largest aircraft types including the A350-1000 and the A380, Airbus forecasts demand for 1,590 aircraft over the next 20 years. The French Group, Sabena technics, has appointed Fabrice Dumas as the new Managing Director of its Nîmes site (France). He will be part of the Group’s Executive Committee. Fabrice Dumas, a graduate from ISEP, began his career in 1989 as engineer and brings along over 15 years of management experience. He has held a number of high-ranking positions in the aviation industry such as President and General Director of EADS SECA during the merger with Vector Aerospace and CEO of Indusmeca. Before joining Sabena technics, Fabrice Dumas served as CEO of Novae Aerospace Industry where he contributed to develop the company for over two years. Héroux-Devtek, a leading international manufacturer of aerospace products, has successfully completed the acquisition of all the shares of Beaver Aerospace & Defense and its wholly-owned subsidiary PowerTHRU, from Phillips Service Industries for a purchase price of US$23.5 million including a US$3.5 million balance of sale payable over the next two years and, subject to final working capital adjustments. The transaction was funded through the Corporation’s available cash on hand. Founded in 1952, Beaver is a vertically integrated manufacturer with a growing portfolio of company-designed products. It designs and manufactures custom ball screws from a variety of materials based on customer and application requirements as well as designs, manufactures, assembles and tests electromechanical actuators. Beaver operates three facilities totalling 82,200 ft² in Livonia, Michigan and employs approximately 100 people. It generates annual revenues of approximately US$30 million, of which about two thirds are derived from the defence sector. Nicola Zaccheo, Sitael CEO, Vincenzo Giorgio, Altec CEO, and George Whitesides, Virgin Galactic CEO, signed at Sitael headquarters a framework agreement that intends to bring Virgin Galactic spaceflights to Italy. The agreement comes after two years of business discussions, government regulatory analysis, studies on potential operations and market assessment. Eirtech Aviation Services are the first Irish EASA Part M CAMO organisation to have gained approval for A320NEO Aircraft. This approval covers both engines types on the A320NEO, CFM LEAP and Pratt and Whitney IAW PW1100G. Eirtech leading the way in providing CAMO support for the next generation of A320 aircraft, the NEO series. Achieving this approval allows Eirtech to support its customers who may require CAMO support on their A320neo aircraft due to delayed aircraft deliveries. This also enables Eirtech to support customers with A320neo aircraft entering their fleet for the first time adding this type to their traditional fleet of A320 classic generation. SAS Scandinavian Airlines released traffic data for June 2018. Scheduled number of passengers increased by 2.6% to 2.7 million in June. Scheduled traffic for the month increased 2.8%, while capacity was up 1.5% compared to June 2017. The load factor increased 1.0 point to 81.8% compared to the previous year. A total of 3,497,286  passengers  chose to fly with Norwegian in June, 437,883  more than the same period last year. Total traffic increased by 44% and capacity increased by 43% compared to the same period in 2017. The load factor was 90.5%, up 0.8 points compared to the previous year. Turboprop manufacturer ATR, has received certification from the European Aviation Safety Agency (EASA) for its new ATR 72-600 Full Flight Simulator (FFS) based at its headquarters in Toulouse. This new simulator is now open for reservations. Manufactured by CAE, it will enable ATR to provide its customers and operators with some 5,000 additional training hours per year. Within a period of 18 months, ATR has put three simulators into service, and another one will soon be installed at a location that remains to be determined. ATR also offers an integrated Cadet programme in partnership with Europe’s top aviation school ENAC. This two-year end-to-end course aims at training high-end ready-to-fly First Officers with Captain’s DNA, thereby offering a long-term solution to the pilot shortage. The first ATR-ENAC cadets will be ready to fly in October. Boeing and Brazil’s Embraer have jointly announced the signing of a Memorandum of Understanding (MoU) for the formation of a strategic aerospace partnership. 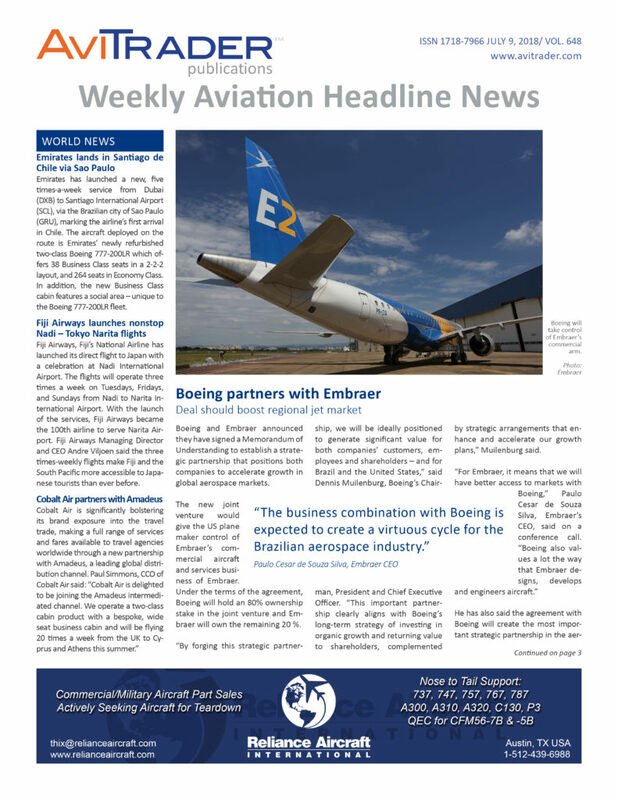 The proposed joint venture will see Embraer’s commercial aircraft and services business align, strategically, with Boeing’s commercial development, production, marketing and lifecycle services operations. The joint venture will see Boeing hold an 80 percent stake, with Embraer holding the remaining 20 percent. Boeing’s stake in the venture is valued at US$3.8 billion based on the US$4.75 billion established as the full value of Embraer’s commercial operations. The joint venture should be well positioned to offer a comprehensive commercial airplane portfolio with jets having from 70 to over 450 seats. In addition, a further joint venture will be established between the two companies in an attempt to develop new markets and applications for defense products, including the KC-390 multi-mission jet. Financial and operational details will be finalized over the next few months, and subject to this and regulatory approval, plus approval obtained from the Brazilian Government, will see the transaction closed by the end of 2019. The WestJet Group of Companies announced changes to its executive leadership team. Bob Cummings, Executive Vice-President, Strategy and Guest Services will retire effective July 31, 2018. Cam Kenyon, Executive Vice-President, Operations is leaving WestJet to return to the United States effective August 31, 2018. Charles Duncan, Executive Vice-President, and President, WestJet Encore has been appointed Executive Vice-President and Chief Strategy Officer, effective August 1, 2018.